snippets: How things have changed - or not?! A parcel arrived a couple of days ago. 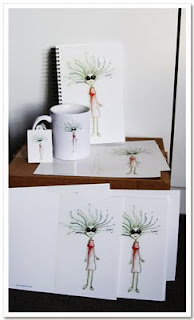 I'd scanned some of my 18yo daughter's art work and ordered some cards online with VistaPrint. But their upselling got to me and I thought, what the heck... So I ordered mugs and a notebook and keyring as well. Great presents for grandparents and teachers. These were a Heinz promotion from about 40 years ago! I remember my mother unpacking the art paper and textas and my two sisters and I sat down to do our best art. That I still have these plates is testament to their durability and my inability to throw things away! I wonder if my daughter will still have her mug in 40 years' time! Love love love your blog. Great title. Your dd is very talented. That is a really cute little graphic she created. It looks like something I'd buy for my dd. I'm glad you started this! I'm a follower!hehe. I love your daughter's artwork. Very appealing and a great gift idea. I also had my memory jogged by the plates as our family did one too. My Mum still has the plate. Fun mugs...your daughter's artwork is cute. 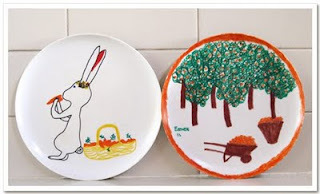 I love those plates, too...we have some that Izzy did a few years ago in preschool, and those are so fun for us to look at. Was she absolutely rapt seeing her artwork on all those products? Can't beat Vistaprint for quality, although the daily emails nearly do me in! LOL And I do remember those plates too! 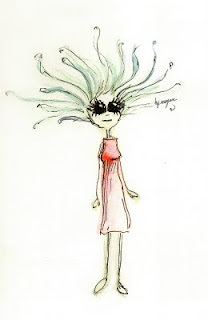 You were an artist all the way back then, and still are with your scrapping!